Once you are on the cell, press F2. This places cursor right at the end of cell contents or formula. To edit the cell from beginning, press HOME key on your keyboard. 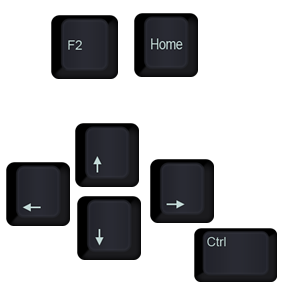 While this might seem like few more steps than mouse approach, it is significantly faster (as you don’t have to juggle hands between keyboard and mouse). Hope this makes a teeny tiny bit more awesome. When I try this in Excel 2010, F2 behaves as stated, but 'Home' just brings me to the leftmost cell in that row, rather that the beginning of the cell content. Is this a setting somewhere? Sue, make sure you hit F2 to edit the cell contents before hitting Home. Ah, I see thanks.. But methinks it's still simple to handle all this with the mouse.. one click to the cell, one click to left or right, and start typing! If you learn keyboard shortcuts and can make it so you never have to touch the mouse, you'll be amazed at how quickly you can start editing a workbook/worksheet. once you hit F2 to edit cell contents you can also use the Ctrl+left or right arrow to jump from beginning to end.